Another surprise that none of us here at Electric Jive knew of. When EJ reader Molemo contacted me and asked if I would be interested in hearing the self-titled Spirits Rejoice album I was confused. 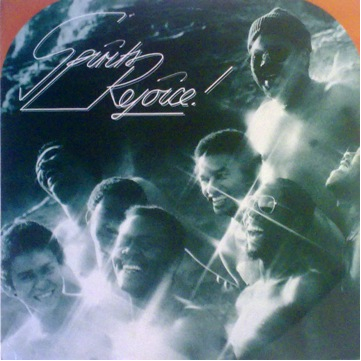 The only Spirits Rejoice LP I knew of was 1976 African Spaces featured here earlier on EJ. 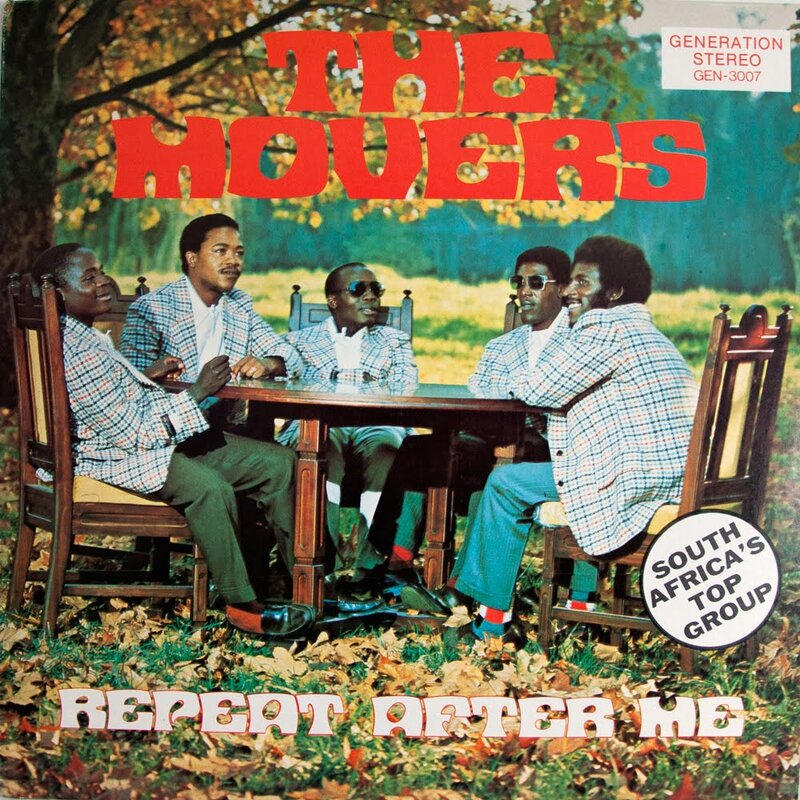 We now know that South Africa’s leading 70s jazz fusion band made another record, this time through Joburg records and distributed by WEA. 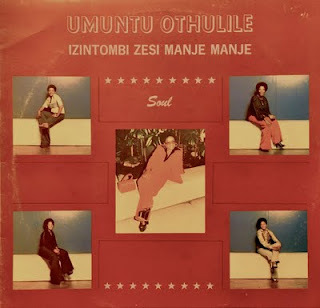 This recording showcases a band that had diversified its style repertoire - remaining rooted in a fusion mould, with a touch of latin, in places it begins to show tiny glimpses of the emerging 80s smooth jazz trend that became so popular in South Africa. Thank you Molemo. George Tyefumani- 1st trumpet and vocal on "emakhaya", additional percussion on "woza"
"Joy"- backing vocals on Happy and in Love" and "Papa's Funk". There's an ownership dispute at the heart of South African jazz composition and anthem Mannenberg. Those disputing Abdullah Ibrahim's authorship point to it being a slowed down version of a Zacks Nkosi tune Jackpot. 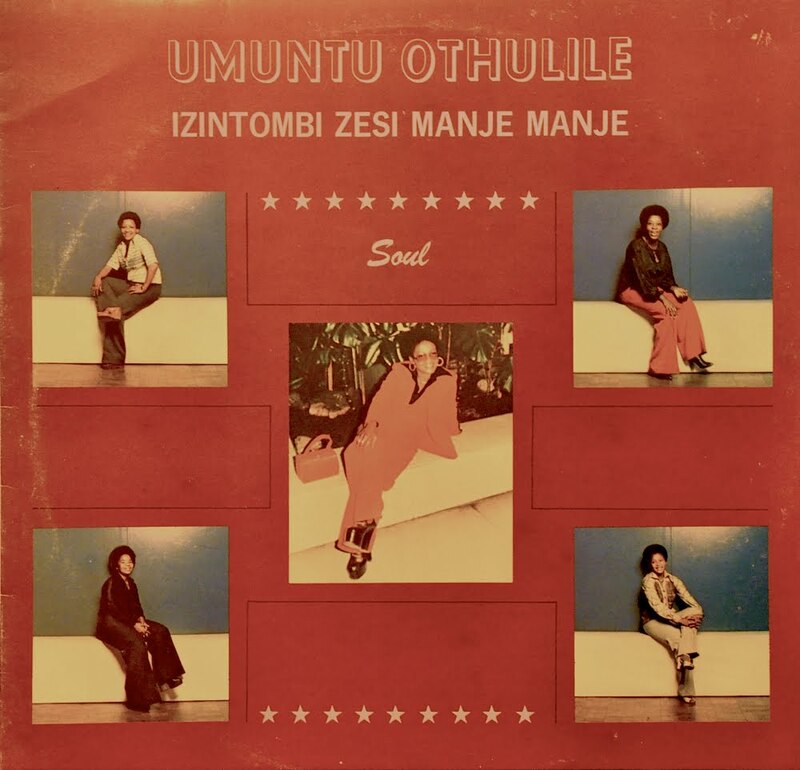 For this reason Lulu Masilela approached the Movers to record the song and have it credited to Nkosi. Producer David Thekwane refused to let Lulu and the Movers credit Nkosi but they did have the pleasure of seeing their version outsell Ibrahim's. 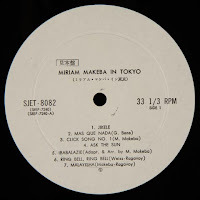 Electric Jive is proud to present a unique, Japan only, release by South African icon Miriam Makeba. 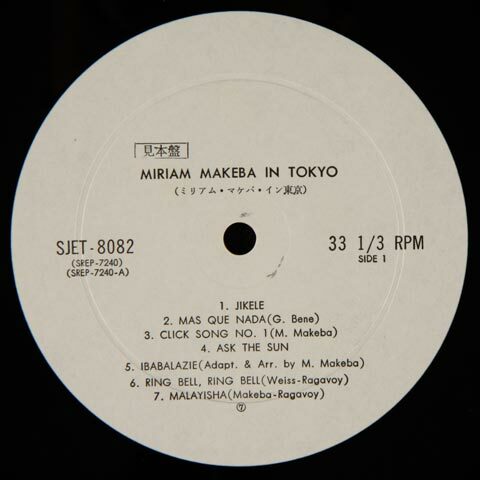 This is one of the rarest of the Makeba albums, coming up (as far as I know) only twice on eBay in the last six years. Recorded in Tokyo on August 28th 1968 this live album comes in the wake of her classic Pata Pata disc, which also marked the height of her US career. The album is Makeba’s second live release after In Concert! 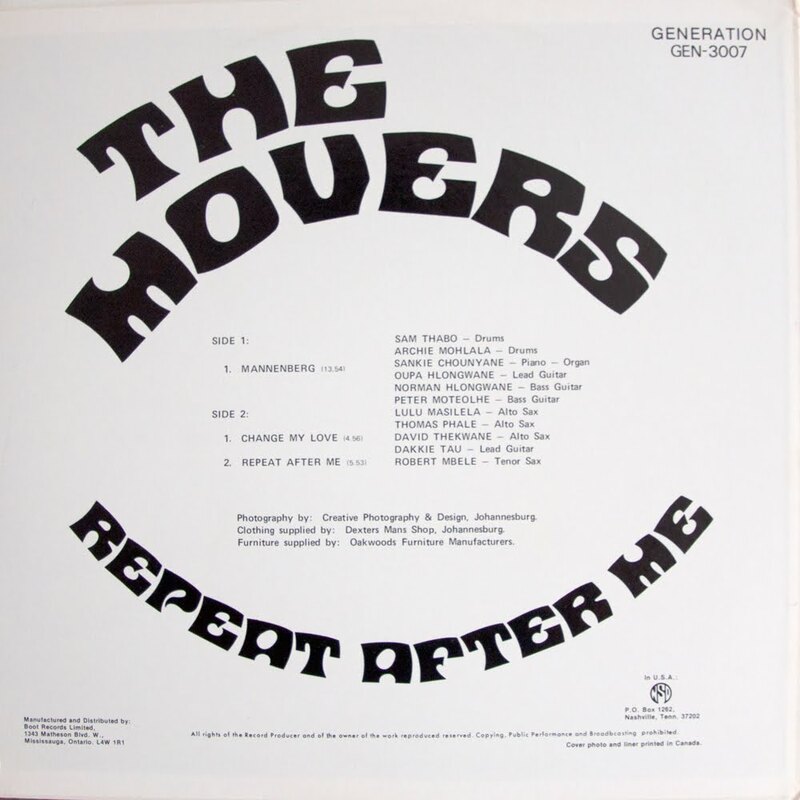 was recorded and issued the previous year in 1967. 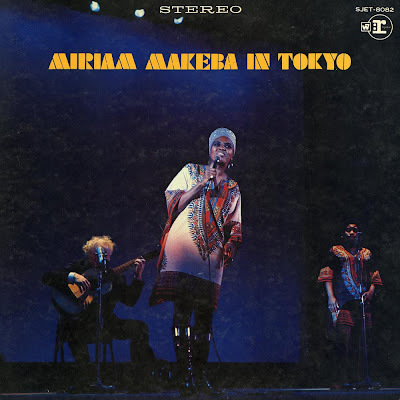 An earlier live recording of Makeba at Bern’s Salonger in Stockholm was made in 1966 and broadcast on Swedish Television in 1967 but was not issued until 2003. The DVD of the Swedish concert is simply stunning and I highly recommend it! Makeba’s Japan tour came at a turbulent time for the singer and anti-apartheid activist. Four months earlier, in April of 1968, she had married Stokely Carmichael, the charismatic civil rights leader and president of the Student Nonviolent Coordinating Committee (SNCC). The marriage came with much media scrutiny including a full color spread in Ebony magazine. The FBI considered Carmichael to be a dangerous radical and extended its investigations to include Makeba. Soon recording contracts were dropped and performances cancelled and by early 1969 the couple had left the US for Guinea. After her 1970 album Keep Me in Mind Makeba had no major-label releases in the US until the 1988 Sangoma. In Tokyo offers many gems, most notably the first live recordings of Pata Pata and Malayisha. 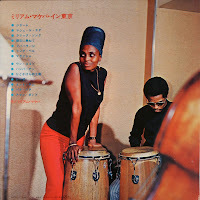 A Manhattan Brothers classic, Malayisha, had been issued as a single by Makeba but was not included on any of her albums at that time. 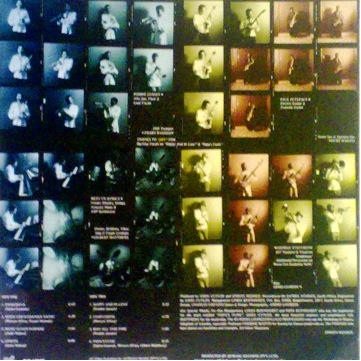 The studio version eventually found a place on the CD re-issue of Pata Pata. For me a notable track on the album is Makeba’s version of Jeremy Taylor’s A Piece of Ground taken from the musical Wait a Minim. Makeba first recorded this song on her album The Magnificent Miriam Makeba in 1966 and an alternative version is featured on the classic Pata Pata album as well as In Concert! The song sung live also gave Makeba the opportunity to subtly bring up race relations in South Africa and it is interesting to compare her almost identical intros to the song on both live albums. The lineup on the Tokyo album includes Sivuca (on accordion and guitar), Leopoldo Fleming (on percussion)—both featured regularly on the majority of Makeba’s Reprise releases—and Jimmy Phillips on bass. A comprehensive discography for Makeba is currently in process… so watch this spot! For more information on Makeba I recommend Ake Holm’s dedicated site! Holm is also responsible for bringing the live Swedish recording to light. Interesting detail... notice the dresses Makeba and her backing vocalist are wearing? 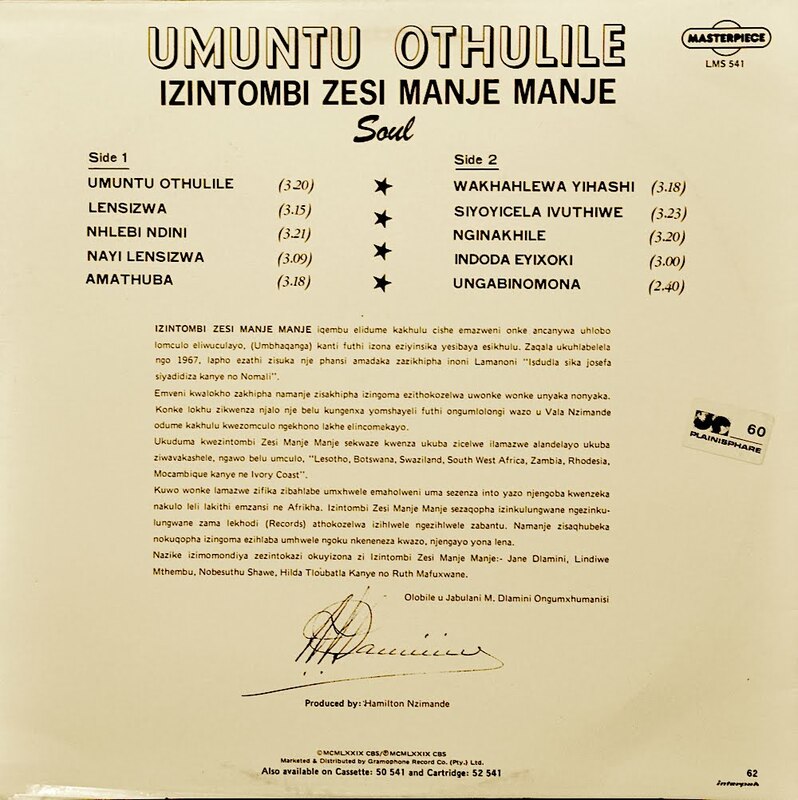 The same dress is also featured as a wall hanging in the cover image of Letta Mbulu's second album Free Soul which was similarly released in 1968. Despite a long professional career that began in 1959 with his brother Robert in the Kwela Kids, Cape Town guitarist Joshua Sithole seems to have left a relatively modest ripple in the discographic waters. His death in 1999 brought testimony of his ubiquity and hard work on the club circuit, and a trickle of fond memories concerning his long-running residency at the Heidelberg Tavern can be found on the web (some recordings, perhaps suggesting the flavour of crowd expectations at the Heidelberg, can be found here). The proceedings of the Truth and Reconciliation Commission, in the case of an amnesty hearing for APLA cadre Luyanda Gqomfa, indicate Sithole was playing the Heidelberg gig on the 30th December 1993 when Mr Gqomfa and others attacked the pub with AK47s, R4s and grenades, on grounds of it being a known Security Forces hang-out. 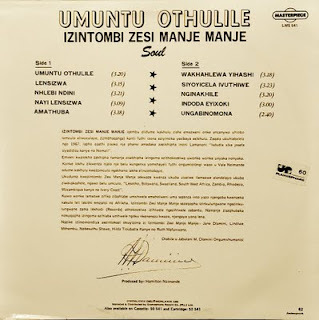 Our friends at Soul-Safari posted a superb Joshua S-penned late 60s Kwela Kids side a few weeks back (here), and today we share a rare full length LP, Joshua Sithole’s Africa, the back cover of which rather confusingly pictures him playing soprano. Needless to say, it is rather heavier fare than covers of 'Wonderful Tonight' and 'Groovy Kind of Love'.